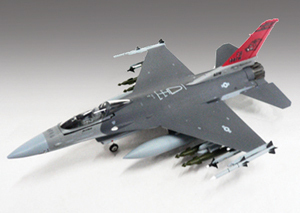 YellowAirplane.com: Diecast F-16 Falcon Figther Jets, Die Cast Aircraft Models and Kits. F-16 Fighting Falcon Die Cast Model Airplanes Military Fighter Jets, Pre Built Diecast Airplanes for Sale. F-16 Fighting Falcon Fighter Jets made by General Dynamics. F-16 Fighting Falcon Military Fighter Jets Pre Built Diecast Model Airplanes, Diecast Models, Scale Models. A large selection of Die Cast Air Plane Models to choose from, for sale and ready to display. of the Fighter Jets Diecast Airplanes Department. in the YellowAirplane store. Diecast Airplanes of the F-16 Fighting Falcon Fighter Jets, Pre Built Diecast Airplane Display Models for Sale. Nicknamed "Viper" by the pilots who flew it, the F-16 was one of the most successful aircraft designs of the Cold War, with innovations that included a frameless bubble canopy for better visibility, a side-mounted control stick for greater control while maneuvering, and a relaxed static stability/fly-by-wire flight control system for smoother flight at higher speeds. Stationed at Alaska's Eielson Air Force Base, the 354th Fighter Wing is the northernmost U.S. fighter wing in the world, providing our nation with combat-ready F-16 Fighting Falcons capable of reaching anywhere in the northern hemisphere at a moment's notice. The wing is also host to the annual Red Flag-Alaska training exercises that allow multi-service forces to practice combat operations over 60,000 square miles of premier rangeland. The F-16 A, Fighting Falcon fighter jets are built by General Dynamics. It used a Pratt & Whitney F100 turbo jet engine producing 14,870 lbs of thrust when in afterburner produced 23,830 lbs of thrust. The F-16 's max speed is 1350 mph with a cruise speed of 577 mph. The "A" model has an empty weight of 14, 567 lbs and a max weight of 33,000 lbs. In contrast, a later version, the F-16 N produced a total thrust with afterburner of 27,000 lbs. These jet fighters come in plastic aircraft models, wood kits, die cast and mahogany aircraft models. Do you want to do something really, really fun, Here to find out more.